These teapots are completely unglazed, with their patterns and colour variations being the result of being wood fired for 3 days straight. Each of these teapots has a completely distinct finish and is paired with a free matching wood fired teacup. 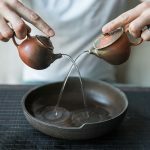 The results of wood firing teaware is dependent on many factors, including clay composition, firing duration, location and placement in the kiln, shape of the kiln, type/composition of wood being burned, and much more. These teapots are primarily made from Jianshui zitao purple clay, with a small amount (<10%) of kaolin clay (高岭土) mixed in. This addition greatly improves stability during such an extended firing process and decreases breakage compared to pieces made from 100% zitao. Many studios in Jianshui are still struggling to develop their wood firing process, which is a costly endeavour that involves many broken pieces. These teapots are the survivors from a custom batch we requested from one of the first studios in Jianshui to develop wood fired teaware. They’ve been at it for 5+ years, having brought in experts from Jingdezhen to learn from and assist in developing new techniques. These teapots all have 7 hole filters and range in capacity from approximately 85-90ml, making them perfect for solo brewing. They feature an extra wide lid, allowing for easy entry of even the most stubborn teas. As these teapots are made of unglazed, porous clay, we recommend designating them for one type of tea. Please see the “recommended care” tab. Check for clay deposits and scrape gently with a wooden or bamboo stick. Place the pot in boiled water and allow to sit for 30-60 minutes. Using new water, add some new or used tea leaves of the type that you plan to use this pot for, boil, add the teapot and allow it to sit for another 30-60 mins. After seasoning your pot, it’s advised to designate the pot for one type of tea (raw puer, ripe puer, oolong, black tea, etc) as the pot will slowly absorb the flavour and characteristics of the tea you use it for. If for some reason you use it with another type of tea, don’t worry. Your pot is not ruined or tainted. The process of raising it is cumulative and happens over a long period of time – one simple session of brewing with another type of tea won’t make a noticeable difference. However, one thing you should definitely not do is use soap or anything other than water to wash or rinse your pot. If it absorbs the properties of tea over time, it will also absorb anything else you put in it, especially anything perfumed or scented.